1 of 6 Line a 15 x 10 x 1-inch jelly-roll pan with nonstick foil or regular foil coated with nonstick spray. In a medium-size saucepan, heat butter, sugar, corn syrup and 2 tablespoons water. Heat over medium heat to melt butter. Increase heat to medium-high and insert candy thermometer (see Note). 2 of 6 Cook mixture about 12 minutes until golden brown and temperature reaches 300 degrees F. Do not stir. Remove from heat and remove thermometer. Carefully stir in 1 cup chopped almonds. 3 of 6 Quickly pour toffee onto prepared pan and spread to edges. Let stand in pan on a wire rack for 30 minutes. 4 of 6 Melt half of the chocolate in microwave on HIGH for 45 seconds; stir to smooth. Spread over top of cooled toffee; refrigerate 20 minutes until firm. 5 of 6 Once firm, flip entire bar over onto a sheet of waxed paper; remove foil. Microwave remaining chocolate on HIGH for 45 seconds. Stir until smooth. 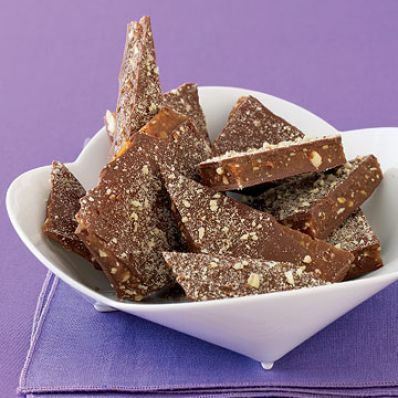 Spread over toffee bar; sprinkle with remaining 1/4 cup almonds. Use waxed paper to slide toffee bar back onto baking pan. Refrigerate 20 minutes more. 6 of 6 Once chocolate is firm, break bar into 2-1/2-inch pieces. Store airtight at room temperature, up to 1 month. Per Serving: 1 g fiber, 9 mg sodium, 157 kcal cal., 5 g sat. fat, 2 g pro., 15 g carb., 10 g Fat, total, 16 mg chol.